Our best camera sunglasses are the most advanced video camera glasses you may have ever seen. Why do we think they are the best camera glasses? daVideo Rikor camera sunglasses record amazing 60fps 1080p video for extreme action sports. Instantly record everything you see with a single click of a button. Why do we think our daVideo Rikor video glasses are the best ever made? Our built in camera lens allows you to tilt the camera up or down to get the perfect shot. The frames are sweat and water resistant. Super lightweight and flexible to fit the shapes of different faces. Lenses are extremely durable and even meet or exceed the Z87.1 standards. We have not found video glasses that we think look as good while recording 1080p HD video. Our wide angle 110 degree lens allows you to record everything you see. Realistic AAC2 true stereo microphones capture crisp clear sounds. You can also share all your photos and videos with friends using our free mobile app which connects to your glasses. Click here to see how our high tech daVideo Rikor camera sunglasses compare with the daVideo Akia and daVideo Presta. 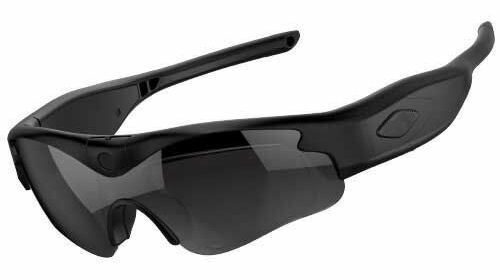 The daVideo Rikor best camera sunglasses can output a wifi signal; wirelessly connect it to any iOS/Android device and app.